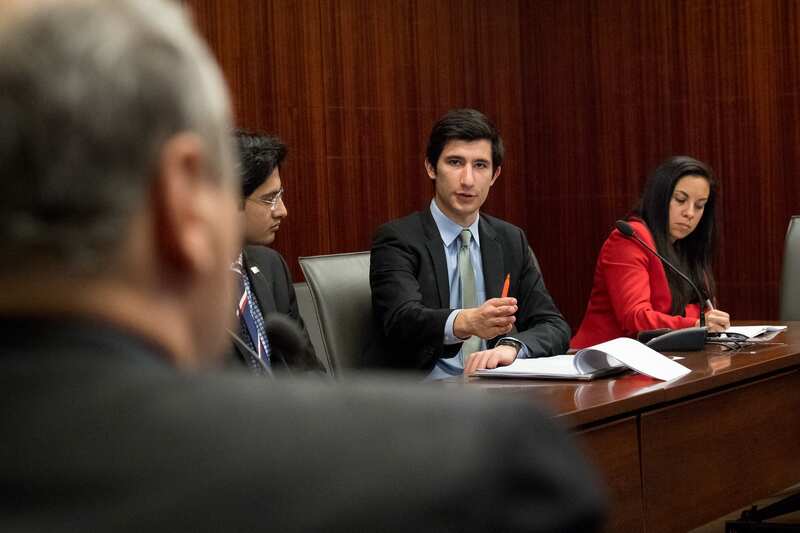 David Shirzad at a meeting with the Tower Scholars Program in Washington D.C.
HCM Tower Scholar and Student Body President David Shirzad has dedicated his time at SMU to making the school a better place. He’s been a Peruna handler, a member of the Mob (a group of high-spirited students guaranteed tickets to men’s basketball games), a student representative to the Board of Trustees and more. His latest mission is to give students more opportunities to have their voices heard. For this month’s Scholar Spotlight we talked to David about his time at SMU and what advice he has for younger and incoming scholars. What drove you to be so involved at SMU? I’ve always had a drive to make the community around me as strong of a place as I possibly can. In high school I was super involved with Best Buddies. There were just awesome people in the club—everyone from the captain of the football team to all sorts of different students. So I thought that was the best avenue for me to serve and promote change and instill strong values around my high school. And at SMU I have sort of done a similar thing—it’s just been different in the topics of discussion. I’ve tried to make SMU have as strong of a campus community as I possibly can. I’ve been doing that in ways such as school spirit, being a Peruna handler, being a part of the Mob, as well as working to increase undergraduate opportunities for research by working as Student Body President with the Provost’s office and others involved in that, or working to better the student voice so that hopefully even if there are issues that come after me students at least have the opportunity to help improve the university. I love SMU, but I value the community and want to make it as strong of a place as it can be. What do you think makes a community strong? I think a place that people believe in. I think a place where all people have a voice, and they believe they’re being heard, is a good indication of a strong community because people buy into that. Nothing’s perfect in that sense, but in some ways I’d say we’re working toward that. What do you consider to be the most important change you’ve made on campus? There’s still a lot of things I’m working on, but I would say increasing the student voice on campus. SMU does not have the same amount of student feedback channels that a lot of other schools have. I’m always working with the administration to create and implement feedback channels such as student representatives to certain groups or student advisory boards. This is important because while there may not be issues I see right now, in the future those groups will be extremely important when an administrator is looking to make changes and needs feedback. It’s also important to have students feel they have a voice on the process of things they care about, which they really didn’t have before. What advice do you have for other Tower Scholars and SMU students who want to emulate your success? The focus right now has shifted to preparing the next group of students to take over leadership at the university. Lucky for me is that I get to have a lot of cool meetings and to be plugged-in to everything that’s really cool and changing around the school. But the issue is that once I leave there’s going to be all of this information and knowledge of the university that leaves with me. So who’s going to fill that gap? I now almost never go to meetings with administrators without a student who is a junior, sophomore, or freshman. I always bring someone who I think has a really strong chance of staying involved and being a leader at SMU.